Groundnuts are famously known by many names. You may have heard of them as peanuts or even monkey nuts. They are among the cheapest nuts, available abundantly all over the world. They are often touted as the ‘poor man’s protein’. Since they are abundantly available, they are priced low and are often synonymous with penury. They come encased in an easy-to-crack shell and have an outer kernel that may often be removed before consumption. Being legumes, groundnuts are very rich in proteins. They are also rich in fats and are used to make extract groundnut oil too. However, their high abundance of fat makes them rather difficult to store. If stored improperly, for a long time, groundnuts can turn rancid and taste bad. The nutritional value may also deplete over time. Here are some of the most significant health benefits of groundnuts. 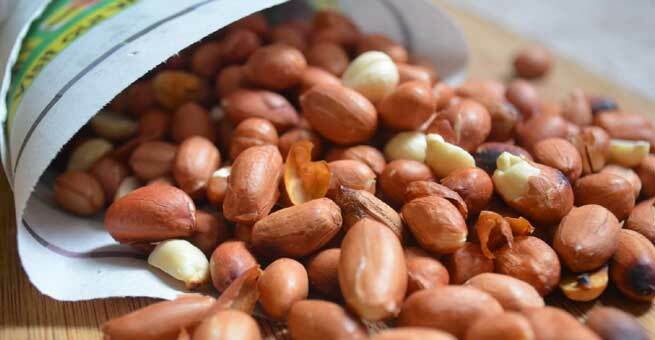 Heart Healthy: Groundnuts contain a lot of fats. However, these fats are very healthy for the heart. They contain both monounsaturated and poly unsaturated fats – which are both good for maintaining the health of the cardiovascular system. They help prevent cholesterol and plaque build up in the arteries, therefore reducing the risk of coronary heart disease. Body Building: Groundnuts are an excellent source of proteins. A 100g serving of groundnuts contains about 28g of proteins. This makes up for about 50% of protein’s RDA. Proteins form the base of all the enzymes and are also digested to produce amino acids – which form the building blocks of all cellular material. Proteins are required for the healthy functioning of the endocrine glands. They also assist in growth and development of the body. However, if you are on a high protein-low fat diet, groundnuts may not be the healthiest option for you. A 100g of groundnuts contain 49.24g of fat, which is 165% of the total RDA. Fertility Booster: Groundnuts are rich in folates and boost fertility. Doctors recommend consuming folic acid when women plan pregnancies simply because folic acid is crucial in the healthy development of the neural tube of the fetus – a development that usually occurs even before a woman realizes she is pregnant. Antidepressant: Groundnuts are a healthy source of Tryptophan – a biological chemical which improves mood and helps in the production of the ‘happiness’ chemical known as serotonin. Women who are suffering from postpartum depression may find groundnuts beneficial. The increased amount of serotonin in the blood can help fight depression and improve your overall mood. Anti Carcinogenic: Groundnuts contain a healthy amount of polyphenols. Among these are oleic acid and p-coumaric acid. Both of them are highly beneficial in neutralizing cancer causing oxygen radicals. Groundnuts also contain a phytosterol known as beta sitosterol. This too is very beneficial in the removal of free radicals that damage internal organs. Prevents Cognitive Decline: Groundnuts are a rich source of vitamin B2 or niacin. This vitamin, though required only in trace quantities, is highly beneficial for maintaining and enhancing cognitive functioning. Adequate intake of vitamin B2 can be really helpful in fighting against age related cognitive decline. Though groundnuts are very healthy, they should not be consumed excessively. Groundnuts can be detrimental to your health if you consume too many of them. A lot of people experience peanut allergies due to some of the proteins in them. In fact, peanut allergy is one of the most common causes of allergy related asphyxiation in the world. Peanuts are also highly susceptible to contamination by a fungus known as aspergillus flavus. This fungus produces a highly toxic compound known as aflatoxin. In large quantities, this toxin can be fatal to humans. Therefore careful selection and storage of groundnuts is extremely important. You should also not store them for long as they may become rancid and unfit for human consumption.